While we search for further interesting developments to guide us in our quest to understanding how robotics and automation are going to change the world of the welder, we again turn our attention to technical matters. We continue to explore another welding essential variable this week. The thought behind studying the essential variables is that most of the important welding basics are in some way or other addressed through the welding essential variables. By understanding these variables, we get a better grasp of welding technology in general. This week we look at the welding current essential variable. The current is also an important contributor to the welding heat input welding essential variable. If you would like to add your ideas to this week’s discussion, then please send me an e-mail with your ideas. Send your e-mails to: compass@welderdestiny.com. 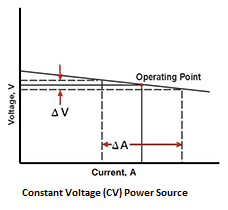 The current is measured in amps, and is one of the easier parameters to measure. This is so, because the amperage, is the same through the entire welding circuit. This means that it can be measure anywhere along the welding cables, and it will give the same measurement. Most modern welding power sources have built-in amp meters, that are usually quite accurate. Inspection personnel typically use external "clamp meters" for measuring the current. These are simply clamped over one of the welding cables, anywhere along the circuit. How we set the welding current depends on the type of welding power source we are using. For the GMAW process, the amperage is also an important parameter in obtaining different ways in which the weld metal is transferred across the arc. This is called the transfer mode. We will look at the transfer mode essential variable in another article, but it is important for our current discussion to remember that for GMAW, the amperage has an effect on the transfer mode. The effect of the voltage is greater, but the welding current is none- the-less also important in this regard. From this equation it is clear that an increase in amperage, if the voltage is held constant, will result in an increase in the power that is being generated in the welding arc. Setting the amperage is one of the most important welding parameters to achieve different deposition rates and also penetration into the parent metal. As a general rule, any given consumable welding electrode will deliver a relatively constant deposition rate per amp of welding current. Essentially this means that if you increase the welding current by 10%, then the deposition rate will also increase by 10%. Another concept to remember is that deposition rates are generally a function of the current density on the end of the consumable electrode. We can think of the current density in terms of the amps per square millimeter cross section of the consumable electrode. In other words, if the welding current is maintained at a constant value, but the diameter of the welding electrode is reduced, then the deposition rate increases. There is a limit to the maximum current density that can be maintained without getting excess weld spatter and other welding defects. For this reason, high deposition welding is generally obtained with larger diameter electrodes while increasing the welding current. Because the power increases with increased welding current, higher amperages typically result in greater weld penetration into the parent metal. High welding power also results in large, fluid weld puddles. Such large and fluid weld puddles are difficult to control when welding vertical or overhead, therefore "out of position" welding is generally done with lower welding currents. In the case of the GMAW process, the transfer mode is an essential variable. 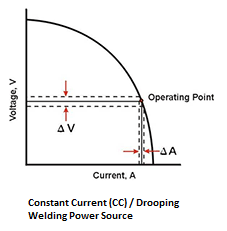 Seeing as the transfer mode is correlated to the welding current, this is again an indirect current control. The Australian pressure equipment welding code is AS 3992. It deals with the welding current in pretty much the same way as ASME IX, through indirect measures of transfer mode and heat input. The Australian cross country pipeline welding code is AS 2885.2. It deals with the welding current in pretty much the same way as ASME IX, through indirect measures of transfer mode and heat input. A widely used subsea pipeline code is DNV-OS-F101. It deals with the welding current in pretty much the same way as ASME IX, through indirect measures of transfer mode and heat input. In Europe, the ISO 15614-1 is a common specification used for many different product types. It too controls the welding current indirectly through the heat input and transfer mode variables. The American structural steel welding code is AWS D1.1. It limits the variation in current for the SAW, GMAW and FCAW processes to plus or minus 10% of the amperage used in the procedure qualification coupon. For the SMAW process the amperage is limited to the range recommended by the manufacturer of the consumable. For GTAW, the amperage is limited to plus or minus 25% of the value used in the procedure qualification coupon. The Australian structural steel welding code is AS 1554.1. It has the same plus minus 10% for the SAW. GMAW and FCAW processes as used in AWS D1.1, but in addition it limits the voltage for the SMAW and GTAW processes to plus minus 15% of that used in the qualification coupon.